Momma Told Me: Your skin is lucky. Just last month I was sitting down at an Outback Steakhouse to enjoy an overdue meal with Momma's sister (my Aunt) and my grandfather. The service was lacking, and we found ourselves with ample time to occupy our mouths with conversation. That was when one of the single most surprising remarks, concerning me, was uttered. My gorgeous Aunt, 9 years the Senior of her husband, and measurements to match a Barbie, waved a hand and matter-of-factly asked, "So, what DO you do to keep your skin looking like that?" I was a bit taken off guard, and humbly choked, "What do you mean?" through a string of fried onion. Certainly my diet at this moment wasn't helping my skin any. She pressed forward, determined, "How do you keep your complexion so even?" For a moment I had to laugh, only to quickly cover with a forced cough. In truth, I am awful about my skin. I've been drinking my 8 glasses of water a day, lately, but I haven't always been so kind to my skin. 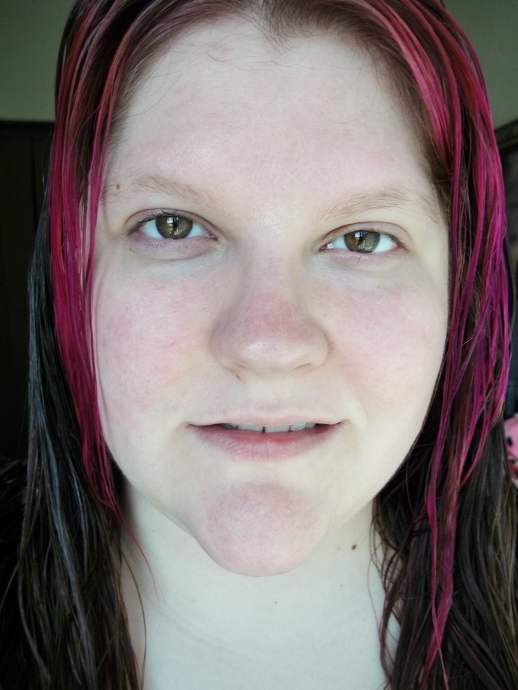 In fact, if I had to admit, I'd divulge I wash (makeup off) my face, maybe, 2 out of 7 days of the week. Every woman knows there are many factors to beautiful skin, some of them entirely out of our control, others more related to environment and diet. For those with hereditary oily skin, or even the opposite end of the spectrum, dry skin, it can seem like a non-stop battle. In Junior High Momma prepped me for, what she was sure would be, 6 teenage years of acne prone skin. As it turned out, I had the occasional breakout, but nothing as severe as Momma had experienced herself. It's really something I've noticed I take for granted from time to time. Every now and then I get on a kick to wash my pillowcases more often, and even my face, but it usually falls by the wayside with another un-tackled goal. In any case, my skin is far from Snow White, as my Aunt made it out to be, and I, too, notice changes in these challenges as the year progresses. Not only do I notice more signs of subtle aging, but the transition from Winter to Spring can be especially harsh (even here in So. Cal). Changes in humidity can turn skin dry and damaged from the Winter into oily, broken out, patches. As our body's largest organ, and the most visible one, it's essential to safe guard against the impending extremes. Just because that mid-week drizzle did little more than put frizz in your hair and make you late for work, doesn't mean it's not impacting your skin on a much more dramatic level. 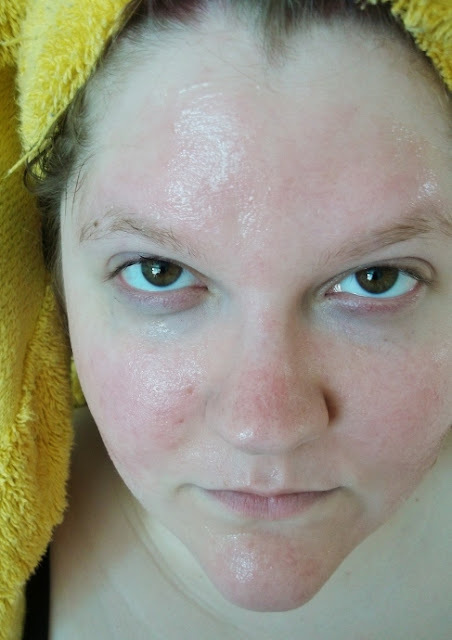 And, as we've discussed before, there's no one magic potion to cure one's skin needs. In fact, what you put on your skin to heal it can be just as detrimental as the symptoms you're trying to treat. That's why I trust my skin to June Jacobs, spa inspired skincare. These products aren't just high end gimmicks designed for sale in spas; but a thriving brand of Paraben and Preservative Free skincare products that has been around for year. One of the things I especially like about June Jacobs is the commitment to quality through an independently owned manufacturing plant. It's rare you find a beauty brand so involved with the production process! 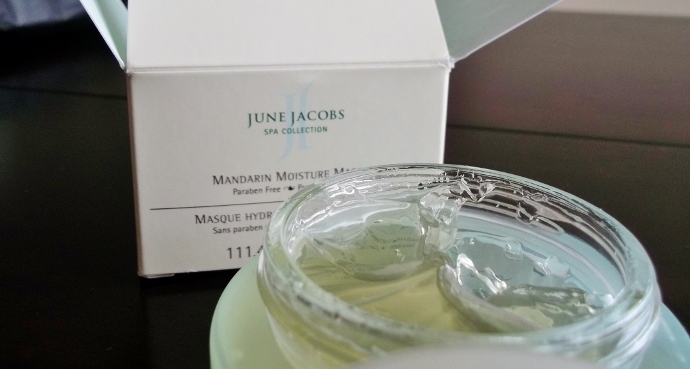 It's no secret I have an addiction to masques, and it will come as no surprise that I jumped at the opportunity to sample one of their most popular products; the Mandarin Moisture Masque. Just one of 7 Masque offerings by June Jacobs, this non-mud based compound is virtually clear and applies like a salve. Presented in a gorgeous, weighted, 3.8oz pot, the Mandarin Masque gel features powerful antioxidants and ingredients such as grape seed, goji berry, and algae extract. Unlike clay based masques, this product goes on very light and cool, evaporating into the skin, rather than drying along it's surface. There is a light residue after dried application, which is simple to wash, and should be followed by any toner or serum skin treatments. Because this is not a mud, it is especially great for those fancy bath towels, and will not stain fabrics. If I'm obsessed with Masques, than I'm equally obsessed with my feet. It may sound odd, but having size 12 feet I have usually resorted to wearing sandals and flip flops (which are the easiest to fit). Living in Southern California, this is actually quite normal, but having my feet in the limelight, so to say, 24/7, means a strict care regimen. I don't shell out money at salons, but I do have a powerful arsenal of at home treatments and luxurious lotions. Like the masque, June Jacobs' Peppermint Hand and Foot Polish is entirely Paraben and Preservative free. Harnessing the nourishing power of Jojoba Oil and Pomegranate Seed Oil, this near translucent scrub is much more gentle than I'd anticipated. The scrubbing beads are varied in size, and very efficient at treating dead skin, while still remaining gentle enough to relax and calm. I just love how the fresh Peppermint scent lingers on my skin, and how soft my heels are afterwards! 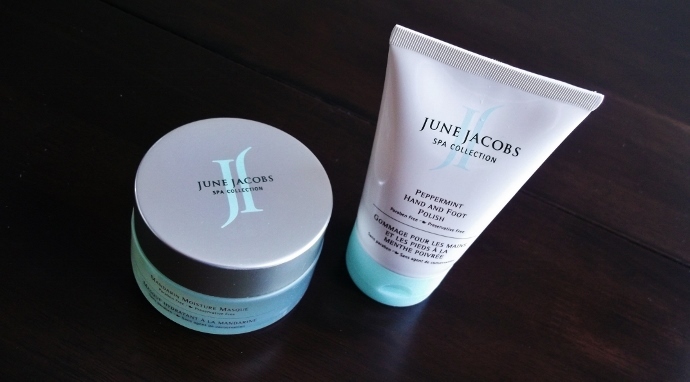 Having used up nearly all of my reserve of both of the above products, I can honestly say that June Jacobs is one of my new favorite skincare brands. Not only is their professional quality spa range reasonably priced, but the product tends to last with noticeable results for days after application. I am curious to experience some of their Haircare or Fragrance line, knowing the aromatherapy benefits will be quite amazing. Most of all, I like the complete lack of preservatives and additives (like color), which keep my linens and skin happy. 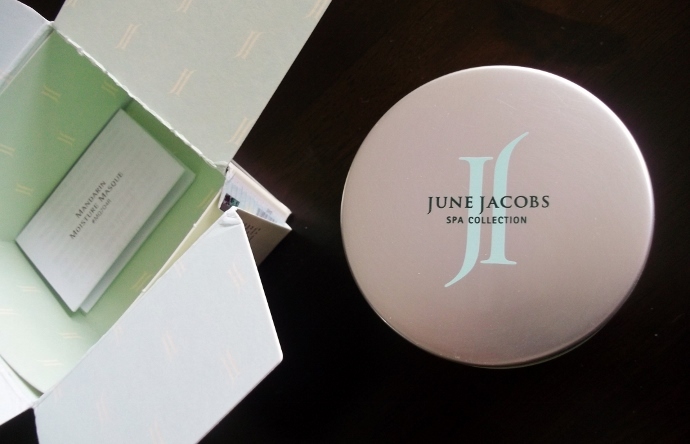 The June Jacobs provides an educated shopping experience, with easy to understand reasoning for each active ingredient in their products, and easy to navigate complimentary product suggestions. Best of all, I can earn rewards for my loyal purchases through the JJ Select program, which makes me feel valued as a customer, and keeps me coming back for more. What Daughter Says: While luck plays into it, I know smart skin care decisions do too! One Momma Told Me reader will win June Jacobs Mandarin Masque and Peppermint HAnd and Foot Polish (a $92 value)! Visit our Blog POP! giveaway LINKY to hop on over to all of the other amazing event giveaways! I like the CITRUS BERGAMOT CANDLE and the ANTI-AGING BLEMISH CONTROL FOAMING CLEANSER. I'd like to try their Intensive Age Defying Hydrating Complex. I'd love to try the Pore Purifying Toner. I would like to try the Brightening Serum. Thanks. My lips are always dry and chapped, so I'd love to try their Lip Renewal SPF20. I would like the Intensive Age Defying Hydrating Serum. it looks like something that could help my skin a lot, and would only take a second to apply. The hand and foot rescue! As a nurse my hands are always so dry and chapped from the constant washing and I am always looking for a great hand cream!! I'd love to try the Anti-Aging Blemish Control Lotion! I would love to try the MELANIN AGE DEFIANCE SPF 20. Intensive Age Defying Hydrating Complex. I would like to try NEW RADIANT REFINING BRIGHTENING MASQUE.